For another consecutive year, HARMAN solutions delivered premium sound and lighting to “Music’s Biggest Night” – the 59th GRAMMY® Awards. In addition, HARMAN powered several programs throughout the star-studded weekend, including the MusiCares Gala and the Clive Davis Pre-GRAMMY Gala. 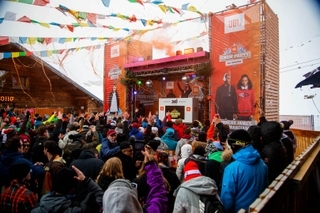 To ensure everyone was tuned in, marketing activations began months ahead of the events. HARMAN kicked off its support on Friday, February 10 with the MusiCares Gala, which honored the legendary Tom Petty as the 2017 MusiCares Person of the Year. The event included performances from a number of iconic artists, including Stevie Nicks reprising two classic duets with Petty, Gary Clark Jr., Don Henley, Randy Newman and Norah Jones. HARMAN also donated a JBL Everest, JBL SB350, and signed and framed NBA jerseys from HARMAN partners Steph Curry and Damian Lillard for a silent auction. 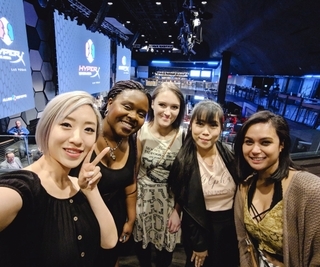 Proceeds from the event benefit the MusiCares Foundation, which offers programs and services to help with the health and welfare of members of the music community. The Beverly Hilton hosted the annual Clive Davis Pre-GRAMMY Gala the night before the show and honored Debra Lee, CEO of BET Networks. The evening featured performances by HARMAN partner DNCE, Neil Diamond, Mary J. Blige and more. 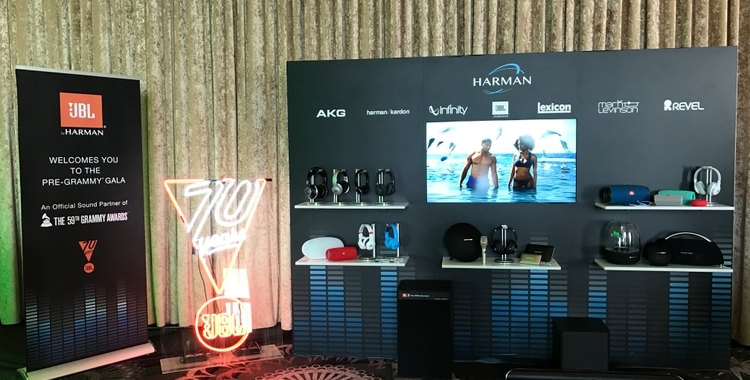 HARMAN’s interactive welcome display showcased several speakers and headphones for onsite listening. JBL was front and center at the gala, with its signature branding showcased at multiple event sites, including the hotel’s marquee, the red carpet, and the onstage and pool area videos. Other pre-/post- GRAMMY events also included HARMAN’s interactive welcome display, along with additional JBL-branded collateral, such as cocktail napkins, tables, menus and carpets. Several HARMAN innovations were used during the GRAMMY Awards broadcast. Longtime HARMAN partner ATK Audiotek employed JBL VTX Series line arrays for the PA system and delivered true quality sound at STAPLES Center in Los Angeles. The telecast’s TV room leveraged JBL Professional’s new 7 Series Powered Studio Monitors. Lighting designers Bob Dickinson and Noah Mitz implemented a number of Martin by HARMAN lighting fixtures, including 20 RUSH Strobe CWL LED linear strobes along with 216 VDO Sceptron 10 (1,000 mm) and 45 VDO Sceptron 10 (320 mm) linear LED video fixtures, provided by PRG. Plus, two days before the big show, a special GRAMMY episode of The Price is Right aired on CBS. The network’s #1 daytime show, which reaches 5M+ viewers, featured a variety of JBL prizes for contestants, including Xtreme, Pulse 2, Everest Elite, SB 350 and Clip 2. This year’s GRAMMY Awards telecast was hosted by James Corden and full of surprises. To learn more about all the exciting happenings at the show, visit the official website.